Can anyone recommend any tutorials or guides for modeling streets, curbs, driveways, etc. ? These need to conform to terrain... but need to be "geometrically realistic"
I've been trying to perfect the most efficient way to do this for years and every job ends up being done differently depending on the project. Terrain size verses amount of roadways/paths and terrain undulation are some of the factors to consider. 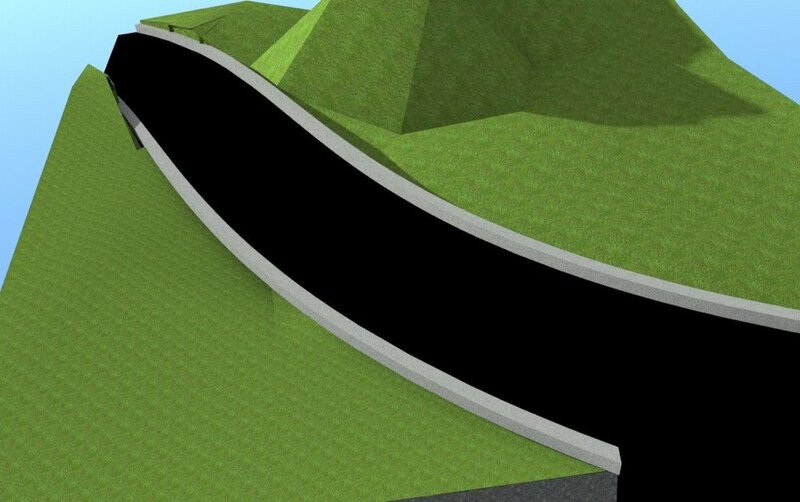 In the past for most jobs I used the terrain tool to generate the landform, then chop away to get the roads etc. Accuracy was dependant on the resolution of the terrain as well especially when sweeping profiles (kerbs). More recently I have had success with a combination of nurbs, sweeps, cover wire tool and even sub-division surfaces. When using these objects in conjunction with the "Segment Sequence" pick option (for selection of the sweep paths for the kerbs). After kerbs (curbs?) are formed (swept) I generally boolean split them at driveways and create the dishing of the kerb separately. It would be a big job to create a tutorial, especially for different scenarios. Maybe a snapshot of the type of terrain/streets you are thinking of doing (as a starting point). If you upload a terrain model and road path I would think of it. I have an idea on how to model it yet it depends on a task. I tried to exercise on simple model and it worked for me.